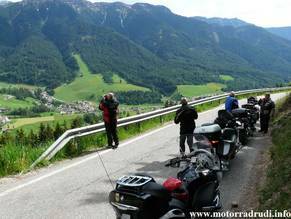 Like last year we started our tour in Montagna, South Tyrol. The house Heinrich was fast fully booked and we could start the further route planning. Unfortunately Heike („Dirty Osirius “) , Franz („Aquarius “) as well as Inge and Rudi („katfish “) failed just before start of the tour, so the number of participants reduced to 17. Together with Alfred, Jacky and Thomas we arrived already on Thursday. Chris and Kurt also came on Thursday. The others should arrive on Friday. We met Alfred (“Merlin”) at 9:30am at McDonald in Sonthofen. Passing Hindelang we went up the pass called “Oberjoch” to meet Thomas (“Toutou”) and Jacky. 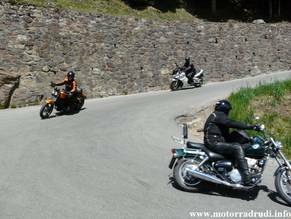 Now on four motorcycles we continued through the valley “Tannheimer Tal” to Weissenbach. We crossed the valley of river Lech and went up the valley “Namlostal”. Here we enjoyed the empty, winding roads and in Bichlbach wejoined the main road to “Fernpass”. There was amazing little trafic and we soon arrived at the road works at the coaching inn Zugspitzblick. When the traffic light showed green again, we had the road to Nassereith for us! After a short stop at the service station in Nassereith we continued passing Telfs on our way to Innsbruck. Here we selected as usual the beautiful ancillary road via Ellbögen to Mattrei. We had lunch in St. Peter in the hotel St. Peter. We only can recommend it!!! The 3 course special was only €6,80. The nice land lady would have liked to sit on Thomas BMW and come with us! 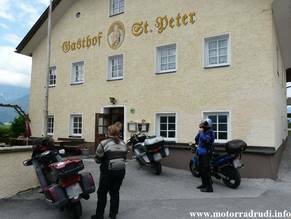 After lunch we continued via Mattrei to Brenner Pass, Sterzing and Brixen. Here we turned left to the pass called “Würzjoch”. The route up to St. Andrea was wunderful! 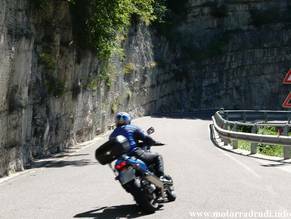 A wide road with good tarmac and wonderful curves –motorcycling at its best! But leaving St. Andrea behind there we experienced the disillusionment! The next 15 km down to the junction leading into valley Villnöss were repaired in the worst way possible! On the entire section you are in constant endeavors to find the gaps in the bitumen rag rug – awful! We continued to ascend throuhg the valley Villnöss via Gufidaun to Lajen. The route is very narrow and very steep, but it offers wonderful of views into the valley Eisacktal down below. In Lajen we had a break for cappuccino. Then the way led us down to Waidbruck. 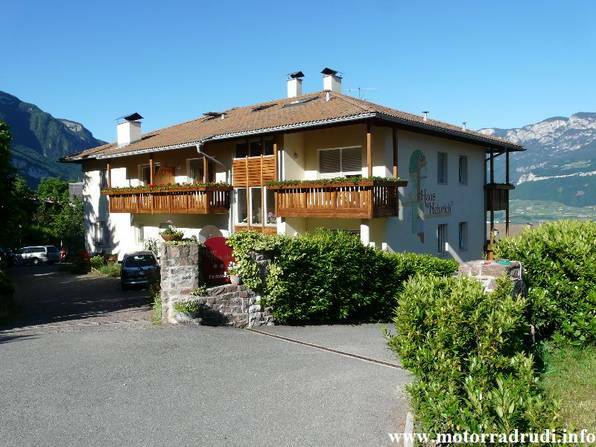 Because of time restrictions we drove then directly via Bozen and Auer to Montan to the guesthouse Heinrich. Mrs. Amplatz welcomed us very friendly and during dinner and later on - together with Kurt („medicus47 “), Chris („sir footloose “) and Gabi (they arrived on Thursday) we could recall the impressions we had on our first day. A view from the balcony: The sun shining - exactly like the day before - and promised a beautiful day. 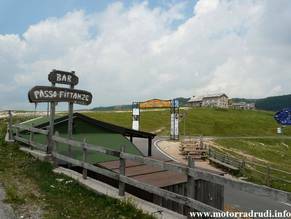 The tour is quite long (370km), especially the 70 km section between Recoaro and Passo Tittanze is fastidious and poses high requirements to the drivers ability. 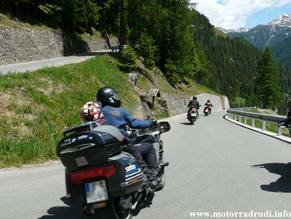 With six motorcycles we took the direct way via Trento to Rovereto as a start. 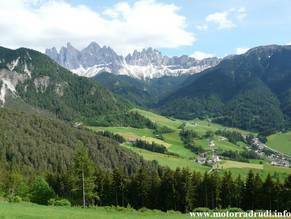 From there we enjoyed the wonderful road up Passo Pian delle Fugazze - wonderful!!! Then a first longer break had to be announced. Afterwards we went down to Valli del Pasubio turning right to Passo Xon and then to Recoaro. Just before enterimg Valdagno we turned right to Castelvecchio and further ascending to Marana. Shortly after leaving this village we turned left, steeply down towards Crespadoro. Then steeply up again to Bolca and San Bortolo. Again downhill (this time on a better road) to S. Andrea. Via Selva di Progno we arrived in Velo Varonese. There, at the left side of the road there is a beautiful cafe, I already knew. Unfortunately they close between 1pm and 3pm (we arrived at about 1:30pm) and so after a short break we left without coffee. Via Bosco we came to Passo Fittanze and the valley Etschtal near Ala (very steep descend with predomonantly more than 20 % gradient). 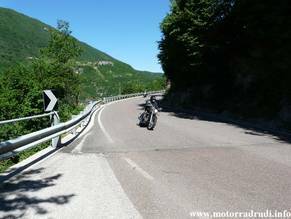 Then we went to Avio, to the next highlight: The road up to the Bocca di Navene - marvellous!!! Swinging from one side to the other we wend steeply uphill. In the rear view mirror I still could see my fellow bikers. After approximately 10 km we turned left and the road went further steeply uphill. When we arrived on the highest point (yield sign), only Kurt and Alfred were behind us! 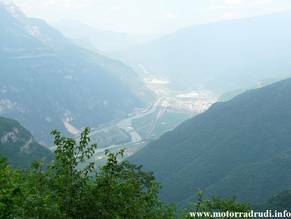 I asked Alfred to wait on the others and together with Kurt we drove to the Bocca di Navene. In expectation that the others would come soon, I ordered two Cappuccino. Still waiting for our ordered Cappuccini I worried, because none the others came! Kurt went back. After we finished our cappuccini we went back together with Alfred, who had arrived in the meantime to search others. On the way downhill we met Kurt who told us that Chris and Gabi were delayed and they, Jacky and Thomas decided to drive directly down to Mori. Telephone contact was not possible. The rest of us drove up again and we had another cosy break with views to Lago di Garda. Then we also drove on the narrow road via Brentonico to Mori. 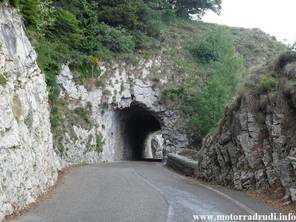 Due to the late hour we decided not to take the planned way via Monte Bondone but to drive directly via Rovereto and Trento back to Montan. Just before 7pm we arrived in Montan. Soon the others arrived too (they also had a break). Also the remaining participants “Alpenbiker South Tyrol Trip“ arrived one after the other. Together we had dinner and a following cosy gathering terminated this day. The tour through the Ultental was our plan! 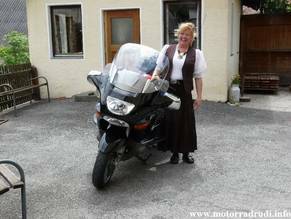 All except Jacky went on this tour and with Eddy (“Ranger) and Friedrich (“1965fede”) from Wolkenstein, we were 13 motorcycles! Approaching Bozen Friedrich took over the lead and piloted us through the city centre of Bozen. Then we climbed up to Jenesien. On the first part we had wonderful views of Bozen. Via Mölten and Vöran we came to Meran and from there directly to the valley of Ulten (Ultental). At its end at lake Weissbrunn we stopped for lunch at the inn „Knödlmoidl“. During our descend to reservoir Zoggler we had a „photo shooting“, everybody had the chance to make some photos. Then we turned south to Laurein. There we went over Brezer Joch (1410m) to Fondo. The next target was the pass Mendel and Monte Penegal. Anybody who has been here before likes to come back, because the views to Bozen in Etsch valley and to lake Kaltern are stunning. Then we liked to go to Kaltern to have some ice cream. A tourist couple recommended an ice cream parlour named “Trude” and gave a description of the way to go. But descending from Mendel Pass I’m used to turn right towards Kaltern, so we arrived from the otherside of town. So I passed our target and Jürgen had to call my attention to that. So the whole group had to uturn and to find an appropriate place to park. Two of our companians (Alfred and Ingo) were missing. Ingo had stopped to take some photographs and met Alfred at the exit towards Kaltern. Together they went on, directly back to Montan. The others enjoyed the ice cream, then Eddy and Friedrich said Good Bye (they went back to Groedner Valley) and we also returned to Montan. After the tour we met at the pizza restaurant „Schloss Enn“ to have our supper. Again a beautiful day with wonderful weather.